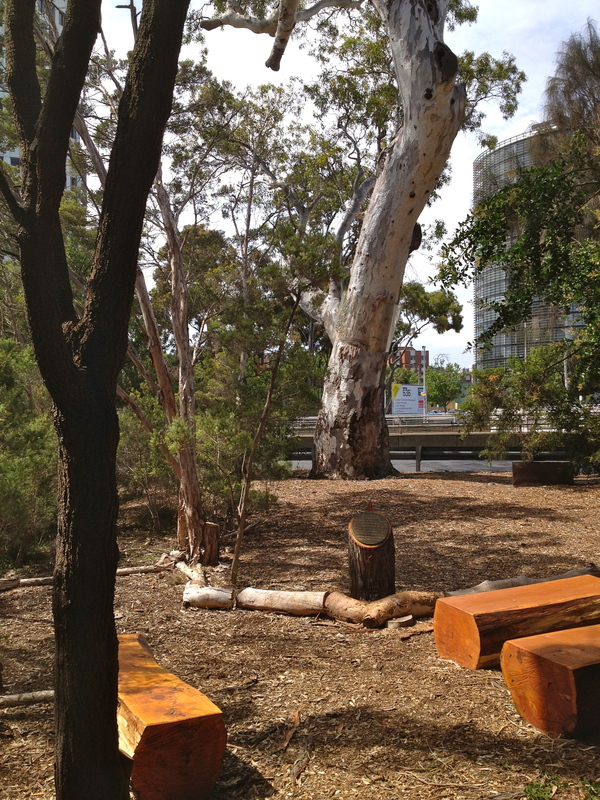 Tucked away in the very corner of Albert Park, behind the Junction Oval, and right on the very edge of the Queens Way on-ramp from Dandenong Road, is a tiny sanctuary of native bush, grasses and wetlands. Blink and you might miss it, or perhaps dismiss it as a bit of unkempt parkland. You'd be wrong - very wrong. 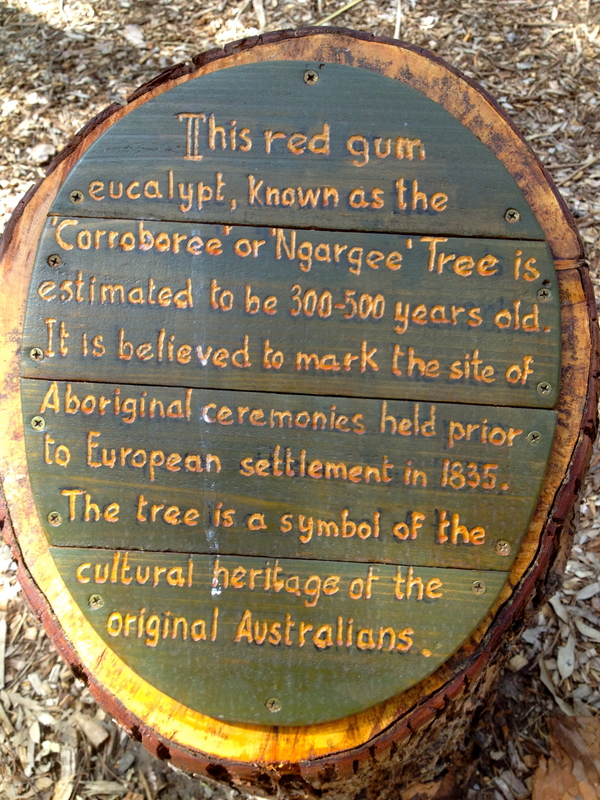 This area actually shelters one of Melbourne's oldest living things: The Bunurong Corroboree Tree, or 'Ngargee' Tree. This towering old giant red gum, thought to be between 300 and 500 years old is a survivor of years gone by, and is sacred to the Traditional Owners of the land where St Kilda sits today. 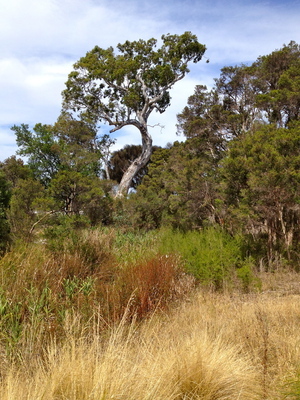 For hundreds of years it has served as a meeting place for the Bunurong people. It remains very sacred to the Aboriginal elders who still meet here to this day to discuss important issues. To find the tree, park in the carpark to the left of the Junction Oval (accessed off the Lakeside Drive) and walk straight along the gravel path at the end of the carpark, following it around to the right, alongside the Junction Oval. 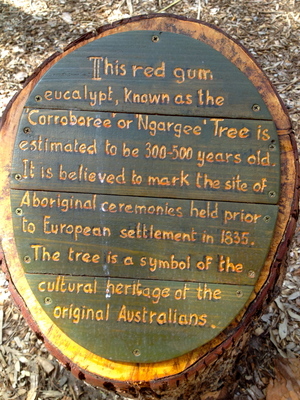 Follow the paths which are marked on either side with branches into the central area with the red gum seating. The enormous tree is in front of you. It's impressive to note that the road beside it was actually diverted from the original plans, to go around the tree. There is a beautiful paved seating area behind you, with plaques telling you of the history of the Bunurong - one of the four main language groups who made up the Kulin Nation. Take some time to pay your respects to and acknowledge the traditional owners of this land: the Bunurong Peoples, and their ongoing links with the land. According to the Historical Society of St Kilda, there were an estimated 50,000 Aboriginal people in Victoria before the arrival of European settlers, but by 1850, this had fallen to a shocking 2000, many of them decimated by introduced diseases and outright slaughter. In the first Aboriginal census conducted in 1839, there were only 89 Bunurong people recorded, and by 1863, there were just eleven. This old man tree has certainly seem some history in its days. Why? If only the trees could talk .... or perhaps they can?